What were the world's deadliest earthquakes? The number of people dying in natural disasters is lower today than it was in the past, the world has become more resilient. You find the data behind this claim and our research in our entry on Natural Disasters. Earthquakes, however, can still claim a large number of lives. Whilst historically floods, droughts and epidemics dominated disaster deaths, a high annual death toll now often results from a major earthquake and possibly a tsunami caused by them. Since 2000, the two peak years in annual death tolls (reaching 100s of thousands) were 2004 and 2010. Earthquake deaths accounted for 93 percent and 69 percent of such deaths, respectively. In fact, both events (the Sumatra earthquake and tsunami of 2004, and Port-au-Prince earthquake in 2010) are in the deadliest earthquake rankings below. 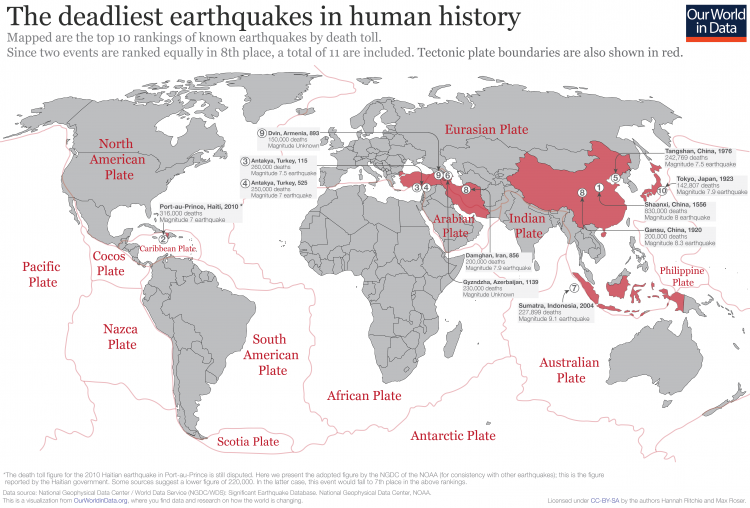 What have been the most deadly earthquakes in human history? In the visualization below we have mapped the top 10 rankings of known earthquakes which resulted in the largest number of deaths.1 This ranking is based on mortality estimates from the NOAA&apos;s National Geophysical Data Center (NGDC).2 This ranking is also summarized in table form below. Two very recent earthquakes — the Sumatra earthquake and tsunami of 2004, and 2010 Port-au-Prince earthquake — feature amongst the most deadly in human history. But equally, some of the most fatal occurred in the very distant past. Making the top three was the earthquake in Antakya (Turkey) in the year 115. Both old and very recent feature near the top the list. The deadly nature earthquakes has been a persistent threat throughout our history. 1 Shaanxi, China 1556 830,000 8 More than 97 counties in China were affected. A 520-mile wide area destroyed. In some counties it&apos;s estimated that up to 60% of the population died. Such catastrophic losses are attributed to loess cave settlements, which collapsed as a result. 2 Port-au-Prince, Haiti 2010 316,000 7 Death toll is still disputed. Here we present the adopted figure by the NGDC of the NOAA (for consistency with other earthquakes); this is the figure reported by the Haitian government. Some sources suggest a lower figure of 220,000. In the latter case, this event would fall to 7th place in the above rankings. 3 Antakya, Turkey 115 260,000 7.5 Antioch (ancient ruins which lie near the modern city Antakya) and surrounding areas suffered severe damage. Apamea was also destroyed and Beirut suffered severe damage. A local tsunami was triggered causing damage to the coast of Lebanon. 4 Antakya, Turkey 525 250,000 7 Severe damage to the area of the Byzantine Empire. The earthquake caused severe damage to many buildings. However, severe damage was also caused by fires in the aftermath combined with strong wind. 5 Tangshan, China 1976 242,769 7.5 Reported that the earthquake risk had been greatly underestimated meaning almost all buildings and structures were designed and built without seismic considerations. Estimated that up to 85% of buildings collapsed. Tangshan therefore large comprised of unreinforced brick buildings which resulted in a large death toll. 6 Gyzndzha, Azerbaijan 1139 230,000 Unknown Often termed the Ganja earthquake. Much less is documented on the specific details of this event. 7 Sumatra, Indonesia 2004 227,899 9.1 Earthquake in Indian Ocean off the coast of Sumatra resulted in a series of large tsunamis (ranging 15 to 30 metres in height). Victims across 14 countries in the regions with Indonesia being the hardest-hit, followed by Sri Lanka, India and Thailand. There was no tsunami warning system in place. =8 Damghan, Iran 856 200,000 7.9 Estimated that extent of the damage area was 220 miles long. It&apos;s also hypothesised that the ancient city of Šahr-e Qumis was so badly damaged that it was abandoned after the earthquake. =8 Gansu, China 1920 200,000 8.3 Damage occurred across 7 provinces and regions. In some cities almost all buildings collapsed, or were buried by landslides. It was reported than additional deaths occurred due to cold exposure: fear from aftershocks meant survivors tried to rely only on temporary shelters which were unsuitable for the harsh winter. 9 Dvin, Armenia 893 150,000 Unknown City of Dvin was destroyed, with the collapse of most buildings, defensive walls and palaces; estimated that only 100 buildings were left standing. With its city defences ruined, Dvin was taken over and turned into a military base by Muhammad ibn Abi&apos;l-Saj, the Sajid emir of Adharbayjan. 10 Tokyo, Japan 1923 142,807 7.9 More than half of brick buildings, and 10% of reinforced structures collapsed. Caused a tsunami with height up to 12m. Large fires broke out; combined with a large tornado, these spread quickly. Since two events are ranked equally in 8th place, a total of 11 are included. National Geophysical Data Center / World Data Service (NGDC/WDS): Significant Earthquake Database. National Geophysical Data Center, NOAA. Available at: https://www.ngdc.noaa.gov/nndc/struts/form?t=101650&s=1&d=1. The death toll of the Haitian earthquake is still disputed. Here we present the adopted figure by the NGDC of the NOAA (for consistency with other earthquakes); this is the figure reported by the Haitian government. Some sources suggest a lower figure of 220,000. In the latter case, this event would fall to 7th place in the above rankings.